Chef Nishihara of Kajitsu in New York City talks to us about his food, philosophy and shojin ryori. New York is arguably the epicenter of food in the US, and yet it’s harder than you’d think to find a memorable meal in this crowded metropolis of up-and-coming chefs. It’s an even greater challenge to find a meal that’s not only memorable, but inspirational as well; the type of meal where you walk away eager to return to your kitchen and start experimenting with the new ideas bestowed upon you. Kajitsu is just such a restaurant, tucked away in the heart of the East Village. Don’t expect to find sushi, or any fish at all on the menu, because Kajitsu specializes in Shojin Ryori, an ancient form of Japanese cuisine that doesn’t use any animal products. For those of us who sway towards a carnivorous diet, the term “vegan” might come to mind, but I hesitate to use that label because other labels like “flavourless” and “boring” often go hand in hand. To Chef Nishihara, who spent a decade training in the art of Kaiseki Ryori in Kyoto, Shojin Ryori is the patriarch of modern Japanese cuisine. 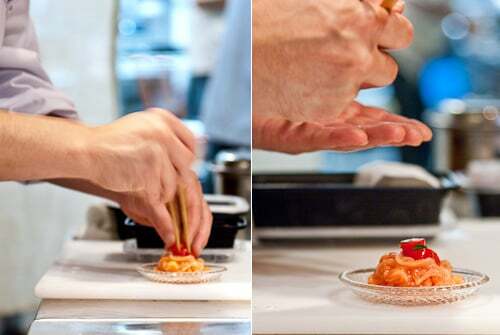 It’s ironic then, that this chef who’s dedicated his career to the purest form of Japanese cuisine, is also an innovator, pushing the boundaries of a 500 year old tradition. 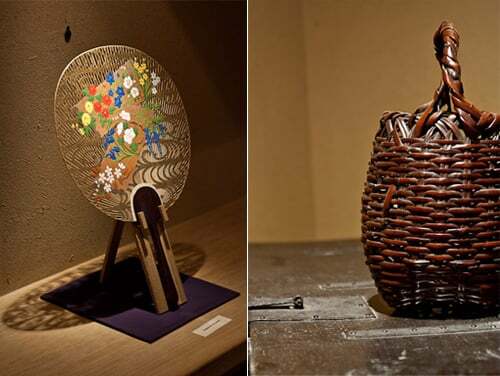 Stepping down into Kajitsu you feel as though you’ve been whisked away from the tree-lined East Village street into an old wooden home in Kyoto. The air is perfumed with the nutty fragrance of ancient timber, and the simple decor directs your eyes towards the few decorative flourishes placed thoughtfully around the space. 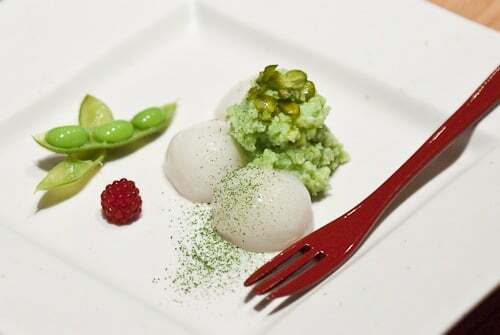 The food is served on antique ceramics and the plating has an artful elegance reminiscent of ikebana. Look closer though and you’ll see the use of seasonal fare such as Zucchini Flower, Kohlrabi and Tomatoes, ingredients more likely to be found in Naples than in Nara. Yet the colours, flavours and textures of each dish flow harmoniously together like a vermillion maple leaf floating down a crisp mountain stream. 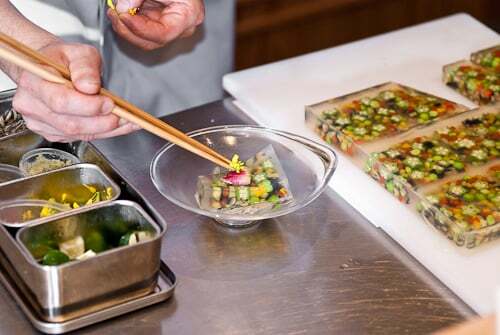 With three supporting chefs in the kitchen, Chef Nishihara stands behind a long wood counter every night, plating each dish with a calm efficiency and artisanal precision that makes yoga look chaotic. I had originally planned to write a full review of Kajitsu, but how do I write a balanced review of my favourite Japanese restaurant in Manhattan? Realizing it couldn’t be done, I decided to interview the genius behind the counter instead. Marc: So when did you first discover your interest for food? Chef Nishihara: As far as I can remember, I was about 8 years old. It was when I made a sunnyside-up egg on a pan after watching my mom making it. I can’t remember exactly how I made it, but do remember I felt so excited when I got a compliment from my mother. Interestingly though, I saw a picture of me cutting vegetables when I was only 3 years old. But I don’t remember it at all. My mom told me that I was cutting vegetables for a barbeque party. Marc: I understand you used to cook using fish and meat. What attracted you to Shojin Ryori? Chef Nishihara: As I studied Kaiseki cuisine, I found that it was originated in Cha Kaiseki, which was a type of cuisine served at tea ceremonies. 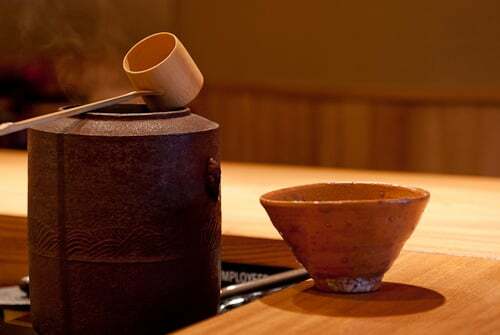 Then I studied further to find out that the very origin of Cha Kaiseki itself was Shojin Ryori. I concluded that Shojin Ryori is actually the very origin of our Japanese cuisine, which I think is amazing. Marc: The menu here reflects your culinary training in Kaiseki cuisine, but also integrates non-traditional ingredients. What inspires these new combinations? Chef Nishihara: In the human world, people of different cultures can get along with each other. Why not vegetables? 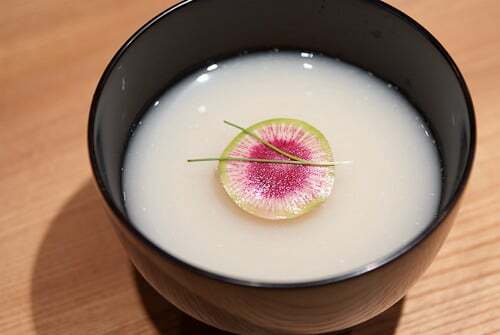 When I look at a Western ingredient that is not typically used in Kaiseki, I tried to get rid of all kinds of stereotypes or so-called traditional recipes for the ingredient, but try to look at it as if I saw it for the first time. Then I try to think what is the best way to get most out of the ingredient in order to make it fit into my other ingredients. Marc: Moving to a new country and starting a restaurant must be quite an adventure. What is one of the best things about being a chef in New York City? Chef Nishihara: The best thing is that people are open-minded toward food. Even though I don’t speak English, through food I make I can communicate with people who are interested in food, which is really great. Marc: …and the most challenging? 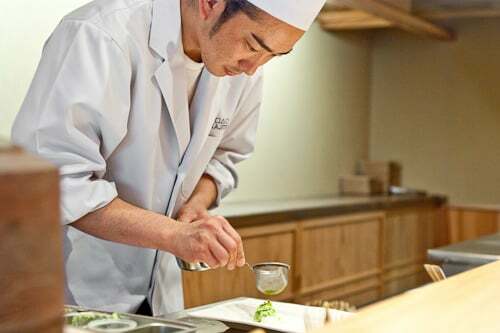 Chef Nishihara: The challenging thing is that people have different tastes. Even among Japanese people there are differences in taste. So including all kinds of people in New York, I still have a hard time to think how to adjust the target “taste/flavor” for each dish. Marc: Many chefs here like to integrate Japanese flavours and techniques into their cuisine. 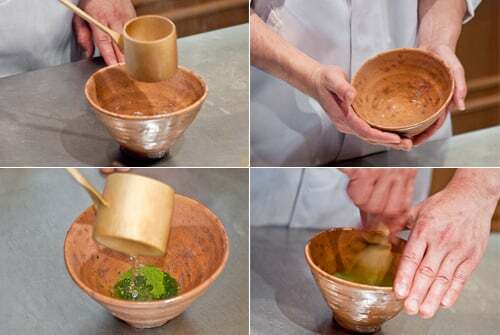 What would be your advice for someone that wants to truly understand the essence of Japanese cooking? Chef Nishihara: If adding doesn’t work, take away. Marc: What are your thoughts on the locally grown sustainable food movement here in the US? Chef Nishihara: I think there should be good relationship between consumers and producers of sustainable food. The restaurants could be perfect mediators who can contribute great support to the movement by buying, cooking, and providing dishes using the sustainable food. Marc: What do you hope customers will take away from their dining experience at Kajitsu? ould be our tables, décor, service, food, etc. Marc: I know you must spend most of your time at the restaurant, but when you are not at work, what do you like to cook at home? Chef Nishihara: Pasta. I look at whatever my wife leaves in the refrigerator and then cook something using them. It’s fun. That is amazing. How in the world do you find these places?! Also amazing is that I thought he’d be a frail old man (well, you did use the word “ancient”… for the food), but I was surprised when I saw the pic! The food looks beautiful! I’m really impressed! I have always enjoyed the many aspects to Japanese food but I had no idea about this form of ancient cookery. Great interview and beautiful photos…I too thought he would be much older. This is so inspiring because it’s a form of Japanese cuisine I never knew existed. I loved the way you compared it to ikebana. I look forward to a visit on my next trip to nyc. thanks! The restaurant looks like a gem, and the chef’s philosophy on food is refreshing and inspiring. Fantastic post, thanks for writing this! That is SO beautiful!! need to try that next time i’m in NY! [very impressed with the translation skills, by the way! Some of those dishes look jewel-like. I wonder what they are. They’re like works of art. I’ve bookmarked this place. Great review. What an oasis of zen that you found. The photos are gorgeous. With food that looks this lovely, I don’t think one would miss meat at all. I can’t get over the colorful vegetables suspended in clear jello. It’s so beautiful! I’m definitely going to try this place soon! This is just amazing. Everything looks so delicate. I’ve heard of this cuisine before but have never actually tried it. It would be an amazing experience. Stunning photos, and the interview is a treat! Wow, Marc. Stunning photos! 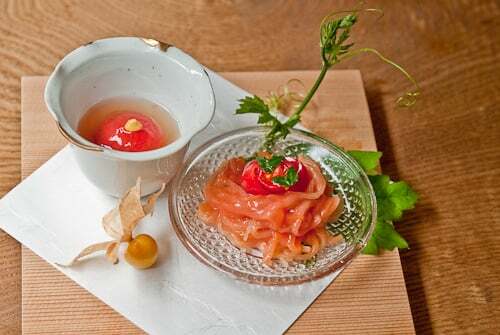 It looks very much like the kaiseki ryori meal I had in Kyoto recently. “If adding doesn’t work, take away.” – I LOVE this. What a great cooking philosophy to have, and it’s so applicable to any kind of cooking – not just limited to Japanese. I’ve never even heard of this restaurant, but I am adding it to my “to try” list! Thanks for sharing. Photos are amazing, and I can’t wait to try the restaurant when I’m next in New York. Great interview and photos. It was a great morning read. Very inspiring to see someone doing so much with food. I’ll have to put this restaurant on my list next time I visit NYC. hi marc, your site is amazing and this entry tells us all about the wonders of japanese cuisine, the good thing about it is that you get to eat beauty on a plate, i have never experienced such excitement and feelings other than with japanese food, i must go back…soon! I’m a spanish living in london, and yes, food here is less “beautiful” but I know my japanese places and love them. Love your photos too. Great post marc! 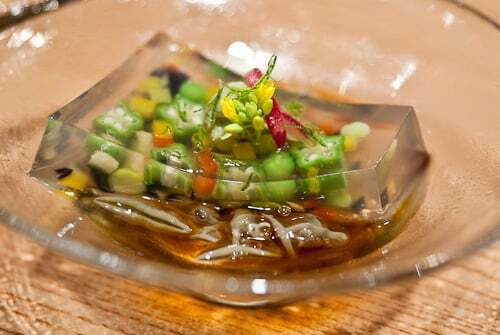 The vegetable/jelly dish is absolutely stunning (and so are the pictures). I usually don’t run after restaurants that don’t serve meat or fish but you convinced me with this post. This chef is an artist. Let me know if you plan of going back, i want to join the party! wow! everything looks so delicous! a great write up! Marc, fascinating article. Thank you so much for introducing me to this fascinating cuisine. I’m going to be in NY next year. Kajitsu will be my first stop. I hope we can also finally meet and grab a bite to eat together. Wow, in the East Village of all places? It wasn’t there when I lived there, unfortunately. I’ve been researching places in Tokyo and outside to have shojin ryori, as I think my husband who’s mainly vegetarian, would like it. I think I’m aiming to try it in temple towns like Kamakura rather than Tokyo now! Splendid job! Thanks for sharing this unique info with us. Great interview, and the food looks amazing with the amount of precision and care in each dish. He seems to put the ‘boring’ tag for Vegan food to boot.